Special Envoy for Syria Staffan de Mistura. 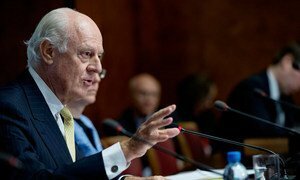 The United Nations Special Envoy for Syria, Staffan de Mistura, is continuing his meetings in Geneva aimed at bringing a political solution to the ongoing crisis in the Middle Eastern country, a spokesperson for the Organization confirmed today. Briefing journalists in New York, Stéphane Dujarric, the Spokesperson for the Secretary-General, said that, as part of the ongoing Geneva Consultations, Mr. de Mistura met with a number of regional and national stakeholders, including Louay Hussain, Chairman of the Building the Syrian State political party; Hassan Abdel Azim, Chairman of the National Coordination Committee for Democratic Change (NCC); and with a Turkish delegation headed by Can Dizdar, Director General of the Ministry of Foreign Affairs. According to Mr. Dujarric, Mr. Dizdar also shared his Government's perspectives on the implementation of the Geneva Communique and the situation in Syria. In addition, Mr. de Mistura met with a French delegation headed by Nicolas de Rivière, Director General of Political Affairs in the Ministry of Foreign Affairs, with whom he discussed the French Government's views on the need for an urgent political solution in Syria. The two officials also touched upon recent developments in and around Syria, which may affect prospects for a peaceful resolution of the conflict, the UN spokesperson noted. At the conclusion of today’s consultations, Mr. de Mistura reportedly said that it remains critical to reach out to Syrian political actors as no one more than the Syrians themselves recognize the urgency of bringing the conflict to end. The Geneva Communiqué was adopted after the first international meeting on the issue on 30 June 2012, and since endorsed by the UN Security Council. The document lays out key steps in a process to end the violence. Among others, it calls for the establishment of a transitional governing body, with full executive powers and made up by members of the present Government and the opposition and other groups, as part of agreed principles and guidelines for a Syrian-led political transition. The United Nations envoy on the Syria crisis has noted recent decisions taken by the National Coalition of the Syrian Revolution and Opposition Forces (SOC) and is looking forward to the arrival of the National Coalition's Envoy in Geneva, where UN facilitated consultations are taking place.